If parking marshals’ allegations are correct, Street Parking Solutions owner Zunade Loghedy appears to be in violation of both the Basic Conditions of Employment Act and the Labour Relations Act. SPS employees who have been on a protected strike for the last two weeks have variously claimed that they are not receiving sick leave, maternity leave or annual paid leave. 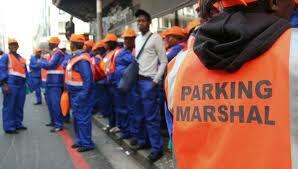 Additionally, parking marshals assert that they have not received a monthly salary since the beginning of their employment, their earnings rather come from whatever amount they collect above their daily targets ranging between R600 and R1 000 depending on what street in the CBD they are assigned to. If they don’t meet their target, they say they have to make up the difference. “This is 4 years of relentless abuse from Street Parking Solutions,” said legal advisor Sarah Hubbard. Prior to 2009, SPS employees signed a contract stipulating that they could take home 23.5% of their daily targets. This condition was apparently removed in 2009. Both Hubbard and Labour Lawyer Amy Stein from Bagraims Attorneys confirmed that this is a serious breach of labour laws and therefore a serious violation of the parking marshals’ rights. “Ostensibly, there appear to have been serious violations of the applicable labour laws and the recent parking marshals strike highlights an obvious need for regulation of the industry,” said Stein. According to John Sifuba of the South African Transport and Allied Workers Union (SATAWU), Loghedy claims that the adjusted 2009 contract allowed for parking marshals to be paid a set wage of R140 per day, but employees, he said, were not made aware of this amendment. The City of Cape Town leases the parking bays to SPS, with whom they have a service level agreement which, according to Hubbard, promises employees that, if they receive enough complaints about SPS violations, the city would intervene. Employees wrote down their individual stories about their alleged abuse from Loghedy to submit to the city, on Wednesday, 30 October, but she says have yet to receive any help. “There is not really a solution from the city. We didn’t get any straight information to see that they are helping. We don’t get strong help from the city,” said SPS employee Michee Bayenda. Hubbard is also frustrated by the lack of involvement by the Department of Labour. Although the City claims they sent a report requesting an intervention from the Department of Labour, the question as to when has not been answered by the City despite repeated requests, and the Department of Labour will neither confirm nor deny receiving any such report. Meanwhile, many employees returned to work last week but most are still unhappy with the conditions of their employment. Some claim their return to work was a result of threatening SMSs from their employer. “Since the call for the strike action, our employer has been texting everybody trying to get us to come back to work,” employee Michee Bayunda said. Employee Wasongo-Motombo who returned to work on 29 October, says he got a different notification. The remaining 60 to 80 employees still on strike convened for a second meeting Thursday, 31 October at the Council for Conciliation, Arbitration and Mediation (CCMA) but Loghedy did not arrive. According to Hubbard the first meeting was a disaster. She explained that upon arrival to the negotiation, Loghedy refused to allow any lawyers or SPS employees into the meeting. The second meeting held between SPS employees and the senior commissioner of the CCMA, to which Loghedy was invited. Bayunda said the CCMA gave the employees a form to fill in to submit to the employer, stating that they want to meet and asking the employer to choose a date and time. As of yesterday, said Bayunda, they had received no response from Loghedy or employee representatives.